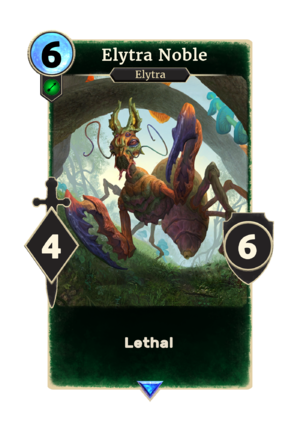 Elytra Noble is a rare Agility creature card. It is part of the Isle of Madness story set. It acts as a double card in your deck with Felldew. Elytra Nobles previously appeared in the Shivering Isles expansion for Oblivion. This page was last modified on 21 January 2019, at 23:58.